Published in the prestigious journal, Nature, the 61-million person study displayed an “I voted” button atop the newsfeed of everyone over the age of 18, monitored whether voting intention was shared with others, and verified if the action had an impact on the user and their friends from official voting logs. Users were randomly assigned to see two versions of the “I voted” message, with one displaying pictures of their friends. Those who didn’t see pictures were barely influenced, “which raises doubts about the effectiveness of information-only appeals to vote in this context,” question the authors. 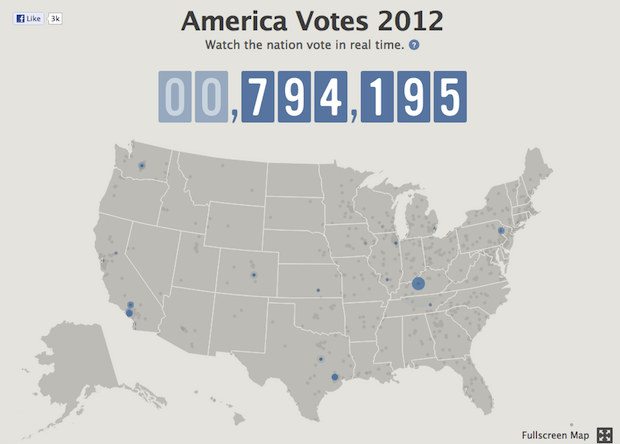 In the end, the message (with pictures) boosted turnout by a respectable 2.2 percent. Most importantly, 80 percent of the effect was indirect, caused by friends sharing the message. So, indeed, you can make a difference, and all it takes is a simple mouse click to spark a chain reaction of civic goodness.